Large arrays of containers are on display at Donington Nurseries to suit all budgets, colour schemes and tastes. 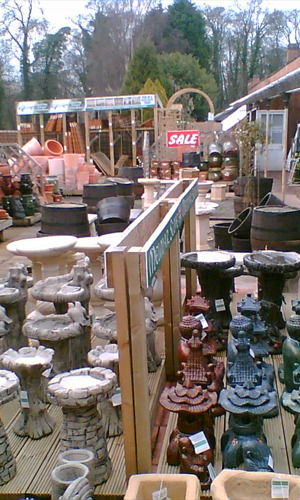 We have an ever-changing selection of terracotta and glazed patio pots, alongside decorative plastic designs. In addition we stock stone troughs and planters and a wonderful assortment of hanging baskets, hayracks and wall troughs. A good selection of Stone Birdbaths, seats and ornaments are available and we have an attractive collection of resin ornaments comprising wildlife figures, gnomes and adornments.